Who are the Royal Knights? The Royal Knights (守護騎士 (ロイヤルナイツ), Shugo Kishi (Roiyaru Naitsu)?, lit. "Guardian Knights") are a group of thirteen Mega-level Holy Knight Digimon that are the Digital World's sacred guardians, and are famed among Digimon as guardian deities of the Computer Network. The group was founded by Imperialdramon Paladin Mode, and serves King Drasil. Because the Royal Knights are assigned the highest rank of Network Security, it is absolutely impossible to violate Security in their presence. With the notable exceptions of Gankoomon and Jesmon, the Royal Knights rarely intervene with the Digital World, and tend to work alone when they do show their face; however, based on a certain "Prophecy" handed down from the ancient Digital World, it is said that the Royal Knights will assemble at the time of the Digital World's greatest crisis. King Drasil gathered the Royal Knights in order to manage the world, and it seems that its will will eventually lead the Royal Knights to cross Servers to the Digital World: Iliad Server and meet the Olympos XII face-to-face. The group also has a natural rivalry with the Seven Great Demon Lords. Most of the Royal Knights are Human Digimon, although there are a few with bestial forms. Like historical knights, some of the Royal Knights are the lords of other types of Digimon, or associate with a team of subordinates, although they are all subservient to King Drasil. Furthermore, each of the Royal Knights possesses a dogma that it believes in. Many of the Royal Knights also have alternate Modes or X-Antibody forms, which are generally still considered Royal Knights. The final member of the Royal Knights, acquired its title through frequent, rigorous training at the direction of Gankoomon, its sponsor. It was originally a Hackmon in which Gankoomon saw promise, and as it traveled the Digital World alongside the Sistermon sisters, intervening in the world's incessant conflicts, it digivolved to BaoHuckmon, SaviorHuckmon, then finally, Jesmon. Some of the species that are members of the Royal Knights have also appeared as characters in other media, but are not members of the group. The official Toei profile for Gallantmon, published three months after the series aired, states that he is a member of the Royal Knights. However, the group is not mentioned within the narrative proper, and the anime's writer, Chiaki J. Konaka, stated in April 2018 that this was not part of his story. During fights, Crusadermon tends to gravitate toward MagnaGarurumon, as they are both the speed-specialists in their respective pairs. It Can't Be! Lucemon Reappears She is also skillful enough to hold off two opponents at once, allowing Dynasmon to search for the key to the fractal code of their target. In the D-Spirit Version 1, Crusadermon is one of the bosses of the final area. She is depicted on Bo-139t. Spiral Masquerade: Chops up the opponent with the four body-sash blades which extend from her armor. Fist of Athena (Urgent Fear): Instantly comes into point-blank range, then starts shooting the opponent in the chest with sonic booms from the Pile Bunker on her right arm. Laser Lattice: Creates an energy net that projects out from the palm. Scarlet Tempest: Uses the Pile Bunker to create a whirlwind about the foe. Dynasmon is the "Passionate Warrior", specializing in powerful, dragon and wyvern-based attacks. Compared to his ally Crusadermon, Dynasmon tends more toward brute force. He is passionate and unwavering in battle, though he can be goaded into letting loose with his emotions and committing overkill. Dynasmon is quick to anger and get frustrated, though he always has his eye on the prize. Dynasmon is depicted on Bo-138t. Dragon Thrower (Dragon's Roar): Fires energy shots from the palms of his hands, with all the attributes of the Ten Legendary Warriors. He can also charge energy in his palms and then physically strike a foe repeatedly. Breath of Wyvern: Transforms his body's energy into an aura of a gigantic wyvern. It is so powerful that Dynasmon cannot fully control it. The Royal Knights are protectors of the Digital World, and initially serve the super computer King Drasil. They are able to confer through thirteen video screens that appear within King Drasil's domain. During the movie, King Drasil's forces are enacting "Project Ark", which is designed to reduce the overload of data by transplanting a small amount of Digimon to a "new Digital World", and allowing the rest to perish with the destruction of the old world. However, this plan is disrupted when some of the abandoned Digimon acquire the X-Antibody, which allows them to survive in the new Digital World. To fix this, King Drasil sends the Royal Knights to eliminate the interlopers. Gallantmon opposed this genocide, and is killed for it, which fosters doubt in Omnimon, eventually causing him to help the mysterious Dorumon, who is revealed as Alphamon, a legendary member of the Royal Knights. The pair confronts King Drasil, and in the end, Omnimon must save the Digital World by destroying his master. Omnimon is a member of the Royal Knights who is loyal to King Drasil, and initially carries out Project Ark to the letter. When Gallantmon confronted Omnimon about King Drasil, Omnimon was unwilling to disobey King Drasil and ended up dueling and killing Gallantmon. Shaken by his friend's death, Omnimon began to question King Drasil's sovereignty. It was only when Alphamon saves Omnimon's life by giving him the X-Antibody that Omnimon leaves King Drasil. He then transforms into Omnimon X and destroys King Drasil with his All Delete, which resets the Digital World as a result. After Alphamon Ouryuken sacrifice against Dexmon, Omnimon gains Alphamon's X-Antibody and, taking his new form, sees King Drasil's actions for what they are. He destroys King Drasil with All Delete, resetting the Digital World. Afterward, he shares a few words with his ally, Gallantmon X. In Digimon World Re:Digitize: Decode he reappears alongside Gallantmon X.
Gallantmon is a member of the Royal Knights who questioned the intentions of the host computer, King Drasil. Because of this, Gallantmon acted individually, and tried to convince his close friend Omnimon that they were just being used and that their master King Drasil's Project Ark was more than it seemed. However, Omnimon refused to listen, and killed Gallantmon in a duel and is revealed that Gallantmon wanted to be deleted so that he may further invesitage King Drasil's intentions. Gallantmon was soon reborn as Gallantmon X, with the X-Antibody. Gallantmon X appeared to help Dorugreymon, WarGreymon X, MetalGarurumon X, and the others fight off the great numbers of DexDoruGreymon and ordered the others to lead them out of the hidden road, and that DoruGreymon will stay and help him fight off the remaining enemies. DoruGreymon asked him why he existed and if he was dead, none of the dangers would have happened. Gallantmon X asked him if he wanted to know the reason he existed and opened the gate to King Drasil's lair. After Omnimon X destroyed King Drasil, which caused the Digital World to reset, Gallantmon X is seen surveying the landscape along with Omnimon X. Then Gallantmon X said to Omnimon X that he was beginning to understand the reason behind Project Ark. Gallantmon X said that King Drasil generally intervened in the Digital World, but the world is a complex place, and that is where it thought about 'fixing it'.Omnimon X asked him if that was really Project Ark, and Gallantmon X told Omnimon that it was the most likely reason behind it. Gallantmon X said that was the time it thought up the experimental being, Dorumon,and they were merely just pawns of King Drasil's plan and King Drasil merely wanted to live, and said that from now on, all the digimon can be happy. In Digimon World Re:Digitize: Decode he reappears alongside Omnimon X.
Magnamon remains fiercely loyal to King Drasil throughout the movie, and is the one who captures Dorugamon and brings him to King Drasil. When Alphamon and Omnimon go to stop King Drasil, Magnamon professes that he still believes in their leader, but does nothing to stop them besides warning King Drasil. Crusadermon participates in the conference with the other Royal Knights, and agrees with Omnimon's suggestion to press the offensive against the X Digimon. Ten thousand years before the events of the story, the "Holy Knights" defeated Dexmon and sealed it away as a Digi-core. Years later, a virus infects the digital world, and only those with the X-Antibody survive. The three surviving Royal Knights make an appearance as allies of the story's DigiDestined—Omega of Power (Omnimon X), Duke of Courage (Gallantmon X) and Magna of Miracles (Magnamon X). At the end of the story, Dorumon is revealed to be their lost leader, Alphamon. Duke, one of the Holy Knights, digivolved to Gallantmon X from MedievalDukemon in order to send the group to help Omega. Magna of Miracles is one of the few remaining Holy Knights. After Dexmon is defeated, he uses his miracles to allow Hikaru Ryuuji to return to the Real World. One of the few remaining Holy Knights, Omnimon X appears as Hikaru's DexDorugoramon rampages out of control. The Holy Knight is no match for the Mega digimon, however, until Hikaru interferes and returns him to his senses. After Dorumon's Dragon Spirit is stolen however, Omnimon X sends Hikaru, Teru, and Masuken to another of the Holy Knights, Duke, while he attempts to track MetalPhantomon. He witnesses the birth of Dexmon, however, and is immediately beaten down by him until Hikaru and the others arrive to fight. In Digimon Data Squad, the Royal Knights are again King Drasil's subordinates. Digimon Data Squad also depicts the largest gathering of Royal Knights, with nine out of thirteen making an appearance. Before the events of the series, King Drasil decides that due to humanity's crimes (most of which are in fact Akihiro Kurata's doing), it is too dangerous to be allowed to live. Though he is convinced to wait by Dr. Spencer Damon, the imminent collision of the Human and Digital Worlds prompts him to move forward with the plan, and he sends the Knights to eliminate humanity. Before they begin, the Knights encounter and defeat the DATS, but are prevented from finishing them off due to the intervention of the rogue knight Kentaurosmon (who is revealed to be Commander Richard Sampson's Kudamon). The destruction of the human world begins immediately afterwards, starting with a battle between Gallantmon and Kentaurosmon, which ended with both being sealed in ice. LoadKnightmon and Leopardmon fall in battle, and Craniamon is defeated by the DATS, even though he was using King Drasil's power, showing him that his sovereign is not absolute. Craniamon then goes to the Human World to replace BanchoLeomon, who was holding the two worlds apart. Eventually, the other Knights also decide to defy King Drasil, and join Craniamon in holding the two worlds apart. After King Drasil is defeated, they thank the humans and return to the Digital World. Craniamon is the closest Royal Knight to King Drasil, and carries out his orders without question. It is revealed that long before the events of the series, he was defeated in battle by Spencer Damon and BanchoLeomon, prior to their encounter with King Drasil. Shortly after Belphemon is destroyed, Craniamon listens to King Drasil's arguments for humanity's destruction, and agrees with his master's decision. He was the first Royal Knight to face the members of DATS in battle, and he overpowers them until Marcus activates Burst Digivolution, digivolving ShineGreymon into ShineGreymon Burst Mode. The tide of the battle turns, but is halted by the arrival of Gallantmon and the other Royal Knights, who defeat the DATS in one attack. King Drasil then arrives and commands the Royal Knights to destroy the DATS, but they are interrupted by Kentaurosmon, who escapes to the Human World with the DATS. Craniamon battles the DATS members again, this time with the impenetrable Omni-Shield given to him by King Drasil. However, the power of all of the DATS' Burst Modes is able to shatter the shield, convincing Craniamon that King Drasil's power is not absolute. Craniamon forfeits the battle, and allows the DATS to face King Drasil. He later travels to Mt. Fuji and replaces BanchoLeomon in holding the Digital and human worlds apart. He struggled with this task until King Drasil's arrival at Mt. Fuji, when he is joined by the other Knights, and they learn of King Drasil's real plan. The other Royal Knights then join Craniamon in holding the two worlds apart, since he is weakening against King Drasil's attacks, while the DATS fend off King Drasil. After King Drasil is defeated, the Royal Knights head back to the Digital World. Dynasmon is introduced when the DATS first encountered the Royal Knights and King Drasil. The Royal Knights are ordered by King Drasil to destroy the DATS, but were interrupted by the sudden appearance of Kentaurosmon, who carried the DATS away. Later, Dynasmon was seen attacking New York City along with the Royal Knights' army of Knightmon. He had a short conversation with Magnamon about Craniamon's battle with DATS, but remained confident of victory after assurances by Magnamon. When King Drasil heads to Mt. Fuji to destroy the Human World, the Royal Knights follow and join in questioning their master's sovereignty, resulting in King Drasil's imperfection being revealed. The other Royal Knights then join Craniamon in holding the two worlds apart, since he is weakening against King Drasil's attacks, while the DATS fend off King Drasil. After King Drasil is defeated, the Royal Knights head back to the Digital World. Gallantmon is introduced when the DATS first encountered the Royal Knights and King Drasil. The Royal Knights are ordered by King Drasil to destroy the DATS, but were interrupted by the sudden appearance of Kentaurosmon, who carried the DATS away. Gallantmon pursues and easily defeats the DATS team, and is about to finish them off, when Kentaurosmon intervenes. A brief scuffle ensues and is ended by Kentaurosmon using "Icy Breath" to freeze both of them in a giant block of ice. Gallantmon attempts to prevent this, but fails, and they fall into the sea alive but incapacitated. In the last few episodes, Gallantmon and Kudamon join the other Knights at Mt. Fuji as Gallantmon explains that he understands why Kentaurosmon had left them, and that Kentaurosmon had used his D.N.A. to free the two of them. The Knights then question their master's sovereignty, resulting in King Drasil's imperfection being revealed. Gallantmon attempts to attack King Drasil, but is thrown back. Craniamon weakens due to King Drasil's attacks, so the other Royal Knights join him in holding the two worlds apart while the DATS fend off King Drasil. After King Drasil is defeated, the Royal Knights return to the Digital World. During King Drasil's campaign to destroy the human world, Leopardmon presented himself to King Drasil, and was allowed to join the battle. Leopardmon then appeared in Japan, and attacked Yoshino "Yoshi" Fujieda, Keenan Crier, and their partners, Rosemon and Ravemon. During the battle, Leopardmon gave his opponents an insight to the Royal Knights' sense of justice, stating that saving the Digital World was a task worthy of even sacrificing its own inhabitants. Determined to save Marcus Damon's family, Yoshino and Keenan empowered their partners into Rosemon Burst Mode and Ravemon Burst Mode, respectively. The two digimon then defeated Leopardmon. The Strategic Knight was then reverted into a Digiegg which was pulled back into the Digital World. LoadKnightmon is introduced when the DATS first encountered the Royal Knights and King Drasil. The Royal Knights are ordered by King Drasil to destroy the DATS, but were interrupted by the sudden appearance of Kentaurosmon, who carried the DATS away. LoadKnightmon also participated in the attack on the human world, commanding an army of Knightmon. When Thomas H. Norstein and MirageGaogamon held back an attack on an airport, LoadKnightmon appeared personally and overwhelmed both them and Commander-General Homer Yushima's partner, Shawjamon. It was only when Thomas activated MirageGaogamon's digivolution to Burst Mode that LoadKnightmon was defeated. The Knight reverted to a Digi-Egg, which was pulled back into the Digital World. Magnamon is introduced when the DATS first encountered the Royal Knights and King Drasil. The Royal Knights are ordered by King Drasil to destroy the DATS, but were interrupted by the sudden appearance of Kentaurosmon, who carried the DATS away. Magnamon is later seen in a conversation with Dynasmon, assuring him of Craniamon's victory over ShineGreymon. When King Drasil heads to Mt. Fuji to destroy the Human World, the Royal Knights follow and question their masters sovereignty, resulting in King Drasil's imperfection being revealed. The other Royal Knights then join Craniamon in holding the two worlds apart, since he is weakening against King Drasil's attacks, while the DATS fend off King Drasil. After King Drasil is defeated, the Royal Knights head back to the Digital World. Omnimon is introduced when the DATS first encountered the Royal Knights and King Drasil. The Royal Knights are ordered by King Drasil to destroy the DATS, but were interrupted by the sudden appearance of Kentaurosmon, who carried the DATS away. Omnimon is later seen attacking a city in the Human World, and briefly reappears when King Drasil is expelled from Spencer's body. When King Drasil heads to Mt. Fuji to destroy the Human World, the Royal Knights follow and question their master, resulting in King Drasil's imperfection being revealed. The other Royal Knights then join Craniamon in holding the two worlds apart, since he is weakening against King Drasil's attacks, while the DATS fend off King Drasil. After King Drasil is defeated, the Royal Knights head back to the Digital World. UlforceVeedramon is introduced when the DATS first encountered the Royal Knights and King Drasil. The Royal Knights are ordered by King Drasil to destroy the DATS, but were interrupted by the sudden appearance of Kentaurosmon, who carried the DATS away. He is also seen attacking Egypt with a Knightmon battalion, and makes a brief appearance when King Drasil is expelled from Spencer Damon's body. When King Drasil heads to Mt. Fuji to destroy the Human World, the Royal Knights follow and question their master's sovereignty, resulting in King Drasil's imperfection being revealed. The other Royal Knights then join Craniamon in holding the two worlds apart, since he is weakening against King Drasil's attacks, while the DATS fend off King Drasil. After King Drasil is defeated, the Royal Knights head back to the Digital World. This information is not part of storyline content, and is not considered properly canon. Alphamon is depicted alongside the other members of the Royal Knights in the second opening of the Japanese version of the show, "Hirari", but does not appear within the episodes themselves. Examon is seen in UlforceVeedramon's story. Xros Memories!! The Boys' Old Days!! While Fusion Fighters United Army, Craniamon, Crusadermon, Dynasmon, Leopardmon and UlforceVeedramon are on Jupiter Zone, Gallantmon is on another Zone fighting other Bagra Army troops. Xros Wars!! The Prologue to the End!! While Fusion Fighters United Army, Craniamon, Crusadermon, Dynasmon, Leopardmon and UlforceVeedramon are on Jupiter Zone, Kentaurosmon is on another Zone fighting other Bagra Army troops. Xros Wars!! The Prologue to the End!! Magnamon is seen in UlforceVeedramon's story. Omnimon is a missing member of the Royal Knights. Bagramon and Tactimon fought him at King Drasil's Stem. According to UlforceVeedramon, OmniShoutmon has the same presence as him. Xros Alliance!! The Final Odaiba Showdown!! UlforceVeedramon believes Omnimon is dead. Xros Wars!! The Prologue to the End!! Craniamon is one of Leopardmon's Royal Knight supporters and is close friends with UlforceVeedramon. He finds himself on top of the Tokyo Metropolitan Building, which leads to one of the staff hiring Keisuke Amasawa to get rid of him, as he was scaring members of other staff. Upon reaching the roof, Keisuke confronts Craniamon, only for him to state he hates humans and for him to leave. Alphamon then arrives and the two talk about their Ulforce, who was stuck in a portal and was unable to get out. They come to an agreement to allow Keisuke to help them free Ulforce and Craniamon uses his sword to open a portal, with the three going inside. Alphamon states that Keisuke is now a digital entity and that his real body is passed out on the roof and that if they spend too much time in this portal, he will be unable to return to his body, effectively making him dead, so that they have to be quick. Upon getting to where Ulfroce is trapped, Alphamon relises that it is impossible for them to free him and that they need to give up. Craniamon however states he will do no such thing and attempts to go through, though Keisuke stands in the way to stop him. 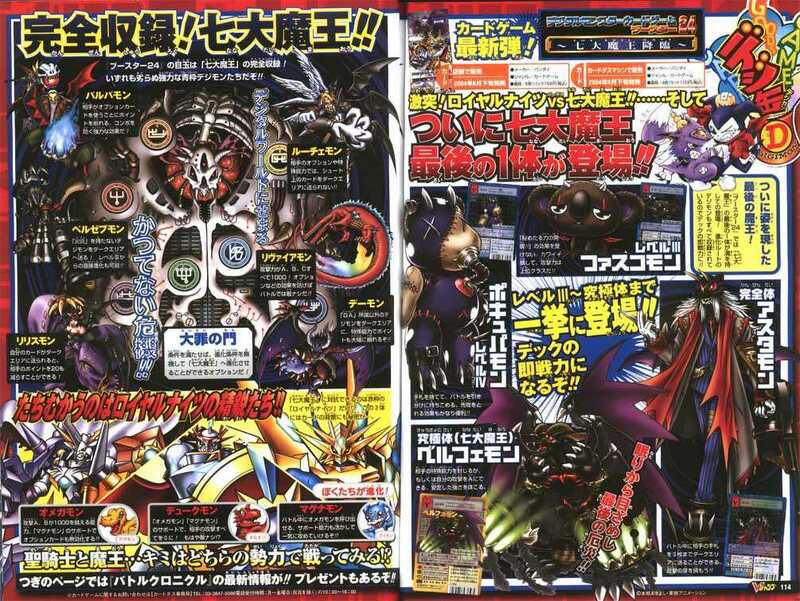 Craniamon then states he will do anything to free his ally, so Alphamon and Keisuke will not stop him. Keisuke and Alphamon however team up to defeat Craniamon, with Craniamon agreeing and thanking with Alphamon stating that he would've died had he tried to free Ulforce. The three then leave the portal, with Keisuke managing to get back into his body. Craniamon states he still doesn't like humans, then flies off with Alphamon. The worker then thanks Keisuke and says that he heard a second giant monster showed up and that Keisuke beat them both up. Keisuke doesn't dispute this and takes credit for beating them both up. Due to Keisuke's action, Craniamon starts to doubt if humans are actually evil, however King Drasil proceeds to mind control him and force him to do as he is told. Later on, Craniamon appears in cyberspace and tries to halt Aiba's progress. However, he is quickly slain because he has doubts about the supposed evil of humanity. Dynasmon is one of the Royal Knights allied with Leopardmon's invasion force. Acting as Leopardmon's right-hand enforcer and occasional bodyguard, Dynasmon appears from time to time to interfere with Omnimon's efforts to sway the other Royal Knights to his cause. He finally faces defeat when Aiba confronts him on their way to stop Leopardmon. Examon is one of the Royal Knights allied with Leopardmon, acting as the brute force of the opposing Royal Knights. Crusadermon opened a portal in the sky, letting Examon enter the Real World. There was a problem, however: Examon had become infected by Eaters and was running amok, though Crusadermon didn't seem to mind. Examon later caused untold amounts of damage to Tokyo. When Aiba first fights Examon, Examon retreats and the mission pertaining to him ends in complete failure. Eventually Aiba, with the help of the infected Arata, has a rematch with the behemoth resulting in Examon's defeat. Examon is the only member of the Royal Knights who allied with Leopardmon to survive. Pendragon's Glory: Rockets up to the exosphere and conducts a high-powered laser firing. Dragonic Impact: Dives from the exosphere and performs a ramming attack shrouded in heat from friction with the atmosphere, mopping up swaths of enemies with the accompanying shock wave. Caledfwlch Rage (カレドヴールフの激昂, Caledfwlch no Gekkou?, lit. "Caledfwlch's Rage"): Raises its speed. Ambrose of Demise (終焉のアンブロジウス, Shuuen no Ambrosius?, lit. "Ambrosius of Demise"): Raises its attack and the chance of landing a critical hit. Gallantmon is one of the human-friendly Royal Knights, as well as Omnimon's best friend and steadfast ally. Gallantmon first appears shortly after Leopardmon's debut, allying himself with Omnimon almost immediately. After Arata is infected by an Eater, Gallantmon becomes concerned about the harm that Arata would do in his current state. Sadly, his concerns weren't unfounded. As Gallantmon and the other benevolent Royal Knights tried to defeat Examon alongside Arata and Aiba, not only did Examon get away, but Arata killed Gallantmon by eating him alive, under the influence of his infection. Gallantmon is the only Royal Knight siding with Omnimon to perish. However, a revived but injured Gallantmon can be seen on the Metropolitan office roof after defeating Leopardmon and Eater Adam. Kentaurosmon is one of the Royal Knights that sided with Leopardmon during his campaign against the Real World. Kentaurosmon is first seen causing chaos in EDEN, prompting Aiba to try and stop him. Kentaurosmon, however, is incredibly fast, and therefore, someone just as fast, if not faster, would have to take him down instead. As it turned out, only UlforceVeedramon can counter Kentaurosmon, as he is the fastest Royal Knight. However, their UlforceVeedramon was unable to cross over into the human world, meaning they needed another one. Mirei Mikagura sends Aiba into another Digital World to recuit her allies, Rina Shinomiya and Veevee to take their place. Rina agrees to help, though only on the condition that they help her defeat Barbamon, who stole Veevee's power to digivolve. After helping to defeat the Demon Lord, Veevee warp digivolves back into his UlforceVeedramon form and agrees to help out. Together they are able to overcome Kentaurosmon. After Kentaurosmon loses to Aiba and Rina, the loss brings him to his senses. It turns out that Kentaurosmon was immensely confused, causing his erratic behavior in the first place. Seeing as nothing is destroyed, Kentaurosmon is allowed to join Omnimon's group a changed Digimon. Kentaurosmon decides to travel with Veevee and Rina. Rina then hires Keisuke Amasawa to take her, Veevee and Kentaurosmon to the best restaurants in this universe, though they keep getting thrown out due to all three of their over excitedness. Eventually they come up with a plan to "eat silently" to not get thrown out but just end up arguing over who gets to be a food reviewer. They then have Keisuke take them to Under Kowloon Lv.5, where they determine that they need to defeat Keisuke first as he would be the best food reviewer. Keisuke manages to defeat the two Royal Knights, though when Rina states that she is not done and wants to fight again for the right to review, Keisuke just runs away rather than keep fighting. Rina seems to eventually give up, as the case is submitted as complete, with Keisuke receiving payment. Leopardmon is the lead tactician of the Royal Knights and the Royal Knight who orchestrated the events pertaining to the Real World's invasion. In response to the Eaters corroding the Digital World and discovering the origins of said monsters, Leopardmon proposed that the Royal Knights invade the Real World and destroy humanity, as humanity was responsible for creating the Eaters in the first place. While others like Crusadermon and Examon agreed with the strategist, others such as Gallantmon and Omnimon did not, choosing to find peace between humans and Digimon instead, creating a civil war between them. Leopardmon led Crusadermon, Examon, Craniamon, Dynasmon, and Kentaurosmon (temporarily) against the humans. Magnamon is one of Omnimon's Royal Knight allies. Magnamon is initially conflicted regarding the invasion of the Real World, being unsure as to whether or not he wanted to support it or stand against it. However, despite Dynasmon's interference, Magnamon is swayed by Aiba into joining Omnimon's cause because Aiba helps out his friend Lopmon, leading Magnamon to decide that humans are worth saving. UlforceVeedramon is one of Omnimon's supporters and the fastest member of the Royal Knights. UlforceVeedramon is first mentioned by Omnimon as the only Royal Knight fast enough to best Kentaurosmon. However, the UlforceVeedramon of that universe was caught in the portal between the Digital and Real World as it closed. Aiba is tasked to recruit an UlforceVeedramon from an alternate reality. ↑ The Magnamon from Digimon Data Squad is listed as an Armor-level in the Digimon Series Memorial Book: Digimon Animation Chronicle, and as both an Armor and a Mega in the Digimon Reference Book, whilst various members are at the Ultra level in various video games. ↑ Bo-660: Imperialdramon Paladin Mode: "The founder of the Royal Knights who guarded the ancient world, a second coming in the modern era!" ↑ 山木満雄 aka C.J. Konaka (@yamaki_nyx). "The setting of Royal Knights is made after Tamers making, so it has nothing to do with the story of Tamers with me. Toei's "setting" is written afterwards and it is a mistake as a character introduction of Tamers." Apr 14, 2018, 10:18 PM. Tweet. ↑ This attack is named "DNA Disintegrator" in its first appearance in Digimon Frontier, "It Can't Be! Lucemon Reappears" . This page uses content from Wikipedia. The original article was at Royal Knights. The list of authors can be seen in the page history. As with DigimonWiki, the text of Wikipedia is available under the GNU Free Documentation License.